Why is a fauji propaganda site registered to Moeed Pirzada? 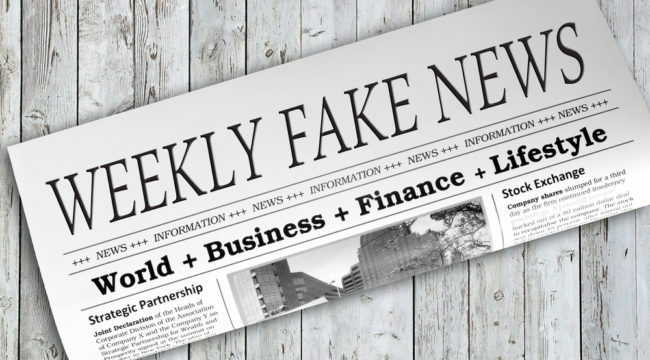 ‘Fake News’ is an old business in Pakistan. From the front pages of Dawn itself in 1971 to today, the powers that be have been obsessed with using media in attempts to redefine facts instead of using facts to understand reality. Over time, there have been several reports that have exposed these operations including the famous ‘connecting the dots‘ by Cafe Pyala and most recently the excellent piece by Umer Ali. Along the way, though, there have also been those who have been willing participants in this fake news circus. People like Ahmed Quraishi and Faraz Karamat. Now questions are being raised about another media personality, Dunya TV host Moeed Pirzada. A little known website ‘Global Village Space’ was quietly launched in 2016 and promotes the writings of well-known ‘perception management’ operators such as Brig Gen (r) Asif Haroon Raja who is regularly featured on other propaganda websites such as the infamous ‘Veterans Today‘ which was a special project of Hamid Gul and more recently Russian propaganda websites. Also featured on ‘Global Village Space’ is Syed Haider Mehdi, another former military officer who is featured on ‘Command Eleven‘. ‘Global Village Space’ also features personalities from Russian propaganda operations. None of this is very surprising as such operations have been exposed for years. However what makes this case interesting is that according to public records, the website ‘Global Village Space’ is registered to none other than Moeed Pirzada. Imagine my shock when I saw the Director of Eurasia Future, Adam Garrie sharing these stories on Twitter, exclaiming: “Make Pakistan Sovereign Again”. In another tweet, he wished Pakistan could get rid of Nawaz Sharif. Several individuals involved with Eurasia Future are also regular contributors for Sputnik International and Russia Today (RT). 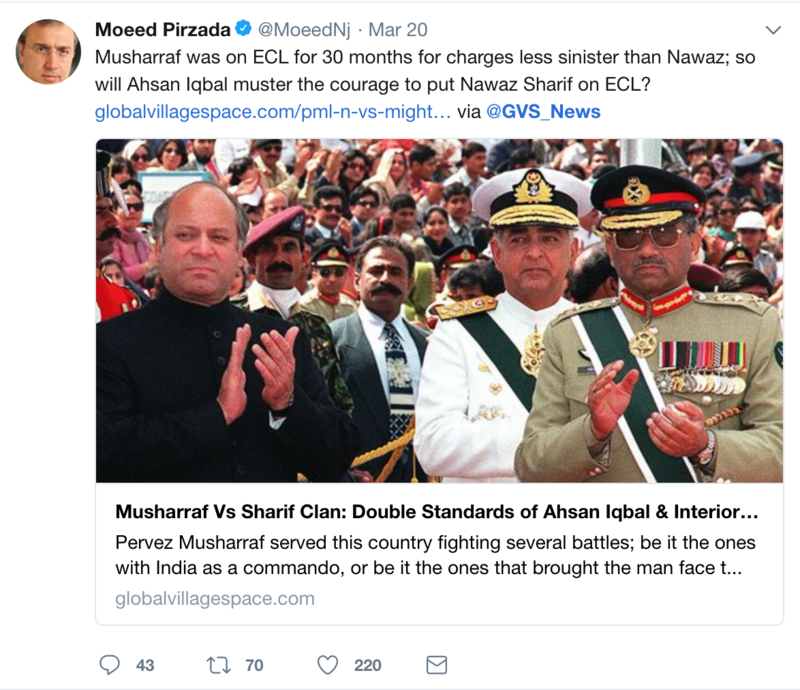 Mr. Garrie also writes for Global Village Spaces, a well-known pro-establishment Pakistani news and analysis website registered under Moeed Pirzada’s name. Is it a mere coincidence then that he was the first news anchor in Pakistan to take up this fabricated news story on his TV show? Shocked, we decided to check this claim and found it was confirmed by the website hosting records. Moeed Pirzada has never pretended to be unaware of this website. Actually, he is listed as an ‘author‘ (but not the owner) where he posts conspiracy theories and praise for Army. He also regularly ‘re-Tweets’ its anti-government posts and conspiracy theories from his own account. This all raises fresh questions about whether Moeed Pirzada is a ‘journalist’ or a planted mouth piece? Are the rumours of his close relationship with the establishment more than just rumours? Obviously, Dunya needs to investigate whether their star anchor is secretly working behind the scenes as part of a propaganda scheme. Rumours are mere rumours, but Moeed Pirzada’s ownership of a fauji propaganda site have become a proven fact. This entry was posted in Blogs and tagged Ahmed Quraishi, Dunya, fake news sites, faraz karamat, Moeed Pirzada, propaganda by Mahmood Adeel. Bookmark the permalink.